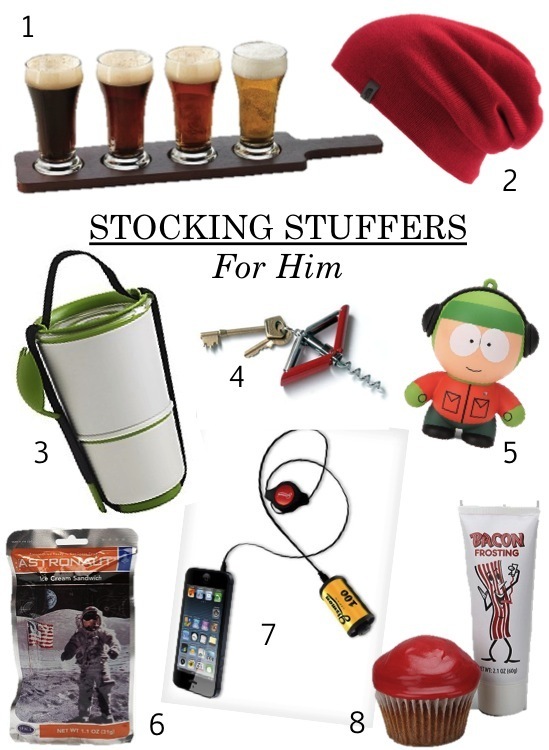 Gals aren't the only ones who rush to see the goodies inside their stockings in the morning, get the guy in your life some stocking stuffer goodies to help keep him entertained throughout the day. For the adult boy in your life look for drinking accessories, gadgets, toys and novelty food to score big points in the stocking arena. For more Holiday Gift Guides, see HERE. Haha, that Kenny speaker is awesome! Great ideas, I love the beer. Hope you can check out my latest post! www.nellecreations.com Like me on Facebook! I will buy him a watch, I don't what kind yet, but a watch is on my list :). Kenny would looove that beer flight tray! Love these suggestions! So hard to find things to put in my hubby's stocking. hahahah OMG Chelsea, that bacon frosting is ridic! I must buy it for my man who is bacon loco! Haha bacon frosting?! I can't tell if I'm disturbed or seriously intrigued. I need to rope a guy in my life into trying that! These are so great. It's always so hard to decide what to get my guy! Most guys like South Park, bacon, and beer~~very very funny and cute stuffers!!! These are such great suggestions. Thanks for sharing! that bacon icing is a great idea!